Those with Alzheimer’s are trying to live a meaningful life, just like the rest of us. In my caregiving experiences thus far, I have learned to bring life to a person who is reaching for it, and seen it improve everyone’s day. There will come a time when that person will be done reaching, and will be finishing. Often, this line is challenging to determine and delicate to walk. But asking the question, “How can I bring the best stories about him or her every day, in one form or another?” has been valuable for me as a caregiver, a musician, and a fellow human. For those of you who prefer Amazon Kindle versions, Click Here. For those of you who prefer Nook versions, Click Here. I want to lighten the step of those on the journey with Alzheimer's. 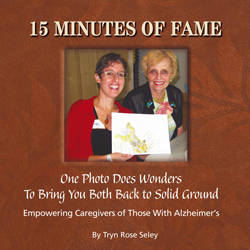 From a decade of caregiving, and a lifetime of appreciating the human experience, the strategies I learned helped me, and I hope they will help you. I'm a musician, photographer, gardener, and author of "Extraordinary Days". This entry was posted in This is the Beginning. Bookmark the permalink. I read this post and all I can think about is my 89 year old Grandfather who is STILL driving. When he drives it makes me very nervous because he speeds and sometimes drinks then drives. The cherry on the top is that my Grandfather has horrible balance! The biggest problem is that he doesn’t want to let anyone else drive. I have to come up with clever ways to make it so I can drive or my alternative is to pray and hold on for dear life. Hi. My senior mom loves to watch our church’s televised services each Sunday at home. I usually go to church often helping with grandkid duty there. On those days I can’t make it, I listen to one of my favorite verse-by-verse Bible studies from Calvary Chapel Philadelphia on my iPod. I’m currently working my way through Genesis. It’s fascinating! What a great offer and great peace of mind for family. So often we hear of senors being discharged from hospital settings with little notice to patients and their families. With the special offers from Home Instead Senior Care and Lifeline, patients and their families can relax knowing that they will make the transition safely home from hospital to home with a professional caregiver by their side. I am sure this will be a huge success. Almost 20 years ago, I lost my first wife to colon cancer. I wish I’d known then what I’ve relaned from Kay Marshall Strom’s excellent Caregiver’s Survival book. Like many people suddenly caught up in the role of caregiver, I was unprepared mentally, physically, and emotionally for the role. I did my best then, but it was far short of what I could have done for her, for the children, and for myself had I only known. My hope now is that this book will find its way to where it’s needed: to those facing the prospect of providing the primary care for a loved one in failing health. She connects to the reader by laying bare her own doubts and hardships in more than 7 years of caring for her terminally ill husband. Her book is filled with the dignity, respect, and hope that, through God’s inspiration, can be developed in even the most hopeless of cases. A caregiver with elementary age children or younger would be a deal breaker for several reasons. First, there is too much chance that they will bring illnesses from school, through children, to my mom. Secondly and probably most relevant, is that I would not feel like I could count on them to be dependable, because I would likely be at the mercy of the mom needing off during all of the children’s illnesses, school meetings, babysitting problems, etc. There are just too many people involved in whether or not the caregiver could get herself to my mom every morning or not. I can’t have last minute call-outs. December 6, 2011What a fun idea! Just found this blog tonight .I have a hubs who has Alzheimer’s at age 47 and we have a 14 year old dahutger and 16 year old son. Life is VERY busy .but I am thinking the support found here will be great!!!! If I have time I would love to put up some Christmas pics at my blog. December 3, 2011Though my spouse does not have Alzheimer’s, he does reuqire special accommodation when it comes to attending services. When we first came from Florida to Georgia, I called the temple ahead of time to first see if they could accommodate my husband’s wheelchair and had a bathroom that I could accommodate him in. They cleared off the ramp, installed a privacy curtain to the bathroom and always made sure that the deacons pushed him to give me a break. As we learned about my husband’s rare spinal conditions they then went further to arrange where he sits both in the winter and the summer to make sure he’s completely comfortable. They are also very patient with my constant popping up and down during the services to get him the things he needs (water, meds, etc.). I’d say the best tip would be is to be in constant communication with church/temple staff they just might come up with a solution that you hadn’t thought of and they’ld probably appreciate a chance to help out.When all of the above mentioned items occur, I am giving the opportunity to feel equal and not different and that makes attending services for me relaxing. May 31, 2012Thank you Denise for the prompting and help in sarhing. Last night on facebook I posted: I continue to take care of my mother who is in the severe stage of vascular dementia. It has been one of the toughest experiences I’ve ever had. I’ve learned more about family and communication in the last ten years than I’ve ever known. Today I’m giving thanks for other caregivers who work daily to care for another. They make such a difference and I’m so grateful to be in their company. If you are caring for a family member or friend (or know of someone who is) join me on Caregiving.com, a wonderful online support group. We share stories, support and solutions. I found this support two years ago. Caregiving can be so rewarding, it is important to have support and not feel alone.Visit Caregiving.com you can read our caregiving story and others in similar situations’.I woke up this morning to comments from friends I haven’t seen or talked with in years. Very touching to experience that connection again. Many of my friends have aging parents with health concerns, I’m hoping they’ll visit Caregiving.com and experience the similarities in stories, and the strong suppport offered here. This is an excellent arlctie on some of the options available to caregivers. Taking care of a loved one with Alzheimer’s can be a difficult task, and this arlctie provides great information on a number of available resources. Adult day care centers like Active Day can provide care, companionship, and much more for your loved one. Consider adult day care for your loved one. It provides a great alternative to traditional care, with many locations and affordable options. Yup, I fit on both ends. I think that, on a day to day basis, kids do require more care, but on an overall basis, sometimes it evens out. When my senior dad’s Parkinson’s Disease got worse, he was put on Hospice that required round-the-clock care that the grandkids rarely need. So sometimes we can spend more time in short crisis spurts for our aging parents. Either way, it is nice to know we’re not alone. Thanks for the interesting article. Purchase the PDF version of my book here! It’s viewable on any computer or device. Searches and Tags allow you to find posts with content that interests you. Thank you for visiting CareGiverHeart.